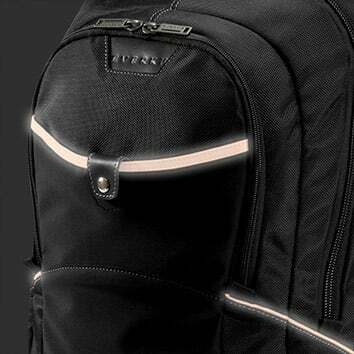 With its slim profile, durable materials and quality construction, reflective strips for safety and the added security of integrated laptop corner guards, the Glide is the perfect compact backpack for the daily commuter. The Glide is EVERKI’s light backpack for the daily commuter. Its low-profile design makes it ideal for a bike or motorcycle; and has the carrying capacity to handle up to a 17.3-inch laptop and your tablet as well. The easily-adjustable shoulder straps allow the backpack to sit evenly on your shoulders, balances the load, and makes the bag easier to carry even when fully loaded. 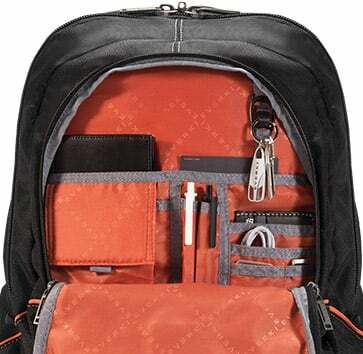 Top-notch materials and EVERKI’s quality construction makes the Glide durable enough to carry as an everyday bag. The design and form are slim yet shapely and there’s even room in the main compartment to pack items for a weekend getaway. 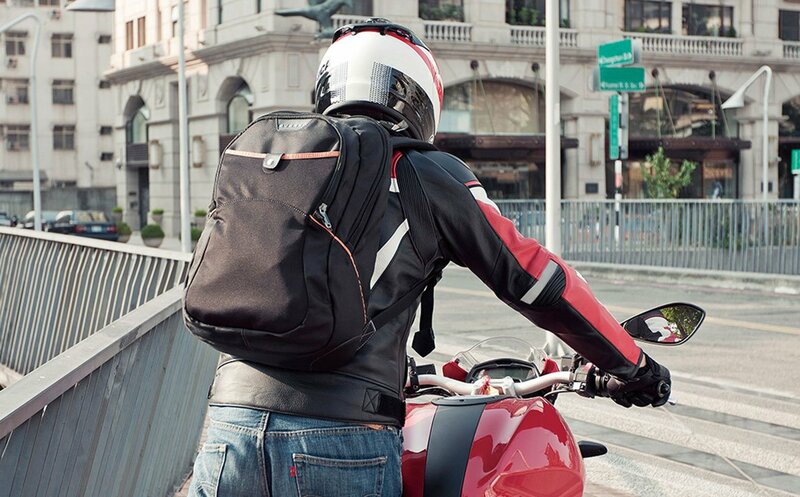 For a daily commuter, it’s important that your backpack doesn’t weigh you down. 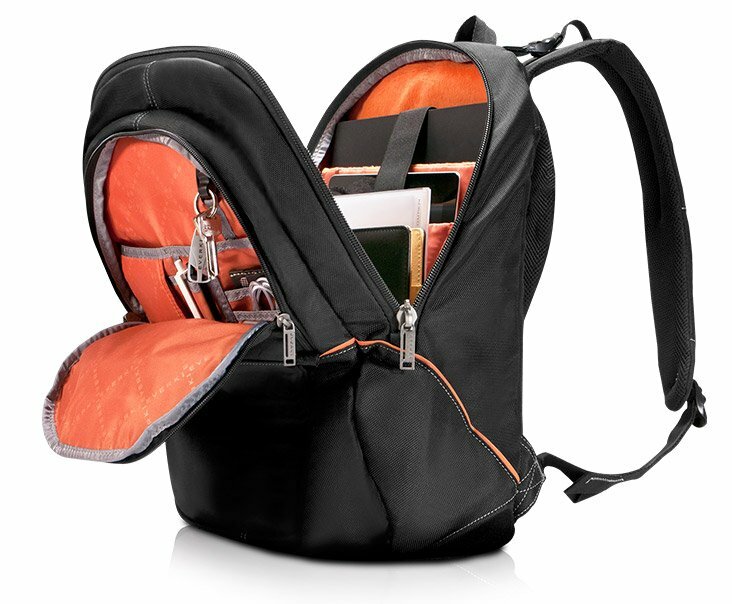 The sporty Glide backpack is specifically designed to carry your 17.3-inch laptop without putting strain on your back thanks to our wide, ergonomically designed shoulder straps and padded lumbar support. 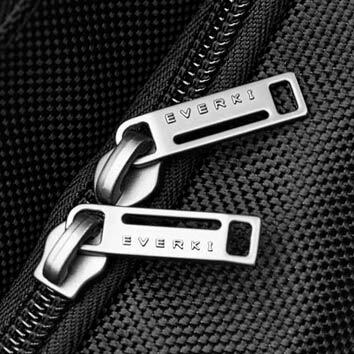 And, like all EVERKI bags, you’ll find the features of the backpack right where you’d expect them to be, with some nice surprises, too – like the hidden stash pocket in the shoulder strap and the reflective strips on the front. You’ll also appreciate the pockets, pouches and slots for pens, business cards and phone; and there’s a dedicated, felt-lined pocket for your iPad as well. Even with all that, there’s still enough room to pack a light jacket in the main compartment; and the low-profile design minimizes bulk. The Glide helps you sail effortlessly through your commute. It’s critical to ensure that your laptop is safe, that’s why we’ve engineered the Glide with additional high-density padding stitched into the lining right where the laptop corners sit. The corner guard system will protect your laptop corners against knocks and bumps – or if you accidentally set your bag down too abruptly. If you’re riding or walking at night, safety is definitely a concern. The reflective orange strips on the front and sides of the Glide match the interior of the bag; but they don’t just look great – they improve your nighttime visibility too. Have you ever broken a zipper on your favorite bag? We have. That’s why we designed the Glide using heavy duty zippers with extra large metal pulls. So your favorite bag can remain your favorite bag. I started my career in the 1980s and began using portable computers in the days of the lunchbox luggables (even built one of those from scratch). For almost 20 years now, a laptop has been my main machine, not just an alternate for travel. As a computer engineer doing 3D content creation, the machines I need for work are not small, not light, and not cheap to replace. I travel a fair amount on business as well, so the quality and durability of my laptop bag is something I take seriously. 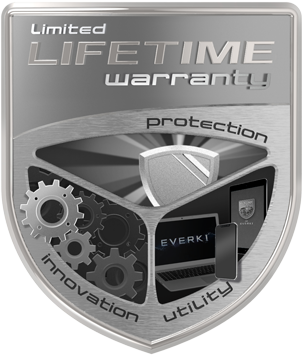 Two years ago, when I bought my current machine, I first heard about Everki from the online laptop enthusiast community. Everyone whose opinion I trusted seemed to rave about this line of backpacks, so I decided to give one a try. I bought the Everki Glide and have used it nearly every single day (even most weekends) for two years. In 25+ years of portable computing, this is far and away the best computer backpack I have ever owned. Admittedly, I take good care of my gear, but even so, this bag has been through its share of airport checkpoints, coffee shops, conference rooms, technical seminars, and more. It still -- literally -- looks almost brand new. My biggest complaint about most laptop bags has been that the shoulder strap connection on the right side begins to loosen for me. I have a terrible habit of picking the bag up by its right strap to slide it onto my shoulders, and so I tend to destroy them. Not this one! There is zero sign of wear around the strap stitching. Zero. * Good mix of interior pockets. I have found that if there are many tiny pockets, I forget what items I put where. 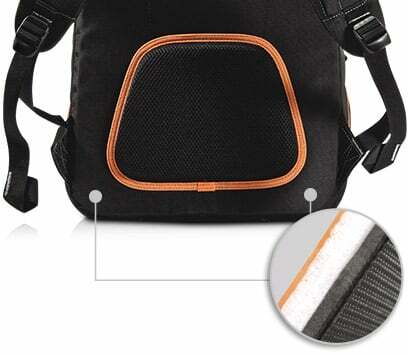 This bag has just a few pockets and compartments, but of decent size and fairly easy to see inside. All the little gadgets and thumb drives can just drop in, and I can see what I want or easily reach in and find it by touch. * The secondary large pocket is apparently a TARDIS, larger on the inside. Not literally, of course, but I'm stunned at how much stuff goes into that pocket, especially if you are efficient in arranging things. The smaller pockets are mostly near the top of the bag, so large items like a gamepad (both for work and for fun, in my case) and external disk drives fit nicely into the bottom and don't bulk the bag's thickness as much as I had expected. This is important because, even fully loaded, I can fit this bag under a standard airline seat in coach class. * Laptop pocket has a separate partition for the machine within the pocket. I can put my laptop into the internal sleeve, and the primary zipper pocket around that sleeve still has a flat space outside the sleeve. I carry an external portable LCD monitor, which slips neatly along the outside of the laptop sleeve, so it and the laptop do not scratch one another. The space where the external monitor goes still also includes room for my brick-sized 330W power adapter *plus* two different lengths of line cord (30 cm and 3 m). Believe it or not, sometimes I *also* manage to get a Zoom H50 conference voice recorder in its protective case into that same area. It's a TARDIS! * The interior is orange. It's a nice balance of looking professional when I attend a developer conference or am onsite at a client facility, but it's also not boring and stodgy. I have without hesitation walked into conference rooms at Fortune 500 companies with this bag. My only -- and very minor -- criticism of this bag is that I wish it had just one small exterior pocket or pouch for small items like an MP3 player and my reading glasses. It would be handy when flying to be able to easily get to those without pulling the bag from under the seat. If it hasn't been clear by now, let me state definitively that I absolutely love this bag. If I ever buy a computer that needs a different size, I'll be back to Everki as my preferred source. Recently bought a backpack, great quality material and lightweight. Doesn't weigh you down whatsoever compared to some other bags. I needed to replace my other bag as it was made for smaller laptops. Looked on the website, some great products. Just had a warranty replacement with my Everki Glide Backpack. Not only am I very satisfied with the bag, but the customer service & response to rectify the situation was top-notch. This is exactly the customer experience I look for when purchasing a premium laptop backpack. Would highly recommend this brand & product to anyone seeking. I just received my Glide backpack. Great product! They have thought of everything possible. I'm really impressed. I will be buying another bag from this company. I recommend this company and its products to you. You will not be disappointed. Thank you. I just bought the Glide (up to 17,3 inches) for my sisters notebook. The backpack seems of good quality, but there is one problem: the opening for the notebook (17,3 inches) barely fits it. So i think it should be made a little bit bigger, so that such a notebook can be stored without difficulties. Overall the backpack is very solid, if not this only mistake i would give it 5 stars.